This is actually one of my favorite days of the year. 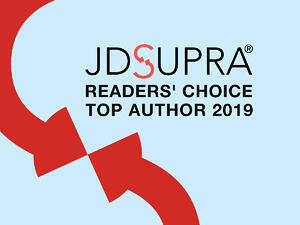 I have the privilege of announcing JD Supra's latest Readers' Choice Awards, recognizing 26 firms and over 228 authors (from among 50,000 who published on the site in 2018!) for the visibility and engagement their excellent thought leadership earned among our readers last year. This year we added a new category, data collection & use, reflecting the critical importance of such a topic to most businesses and individuals in this Age of Data. Categories can change year to year; if you'd like to see a particular focus next year, please let me know. I'd be happy to hear from you. On the subject of data, also new this year, we've made the intelligence on which JD Supra's Readers' Choice Awards are built available to our clients via our on-demand Beacon Insights dashboards. For more information on how your firm can use Beacon Insights, click here. With great pride in all of the excellent thought leadership on JD Supra, and the particular achievement of the authors and firms in these categories, I send you onward to JD Supra's 2019 Readers' Choice Awards.